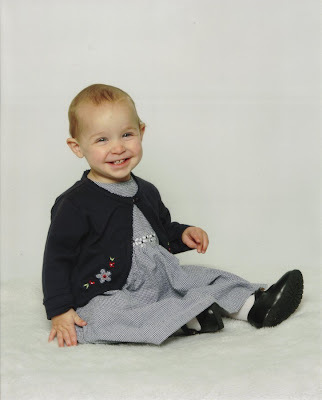 Moments & Musings: Emma at One Year. And now that Emma turned 1 year old three months ago, I'm finally getting her picture posted. At least I had it taken reasonably close to her actual birthday (I think I was a week and a half late this time). Anyway, today Emma is 15 months old. She is quite the character - assessing people and situations very seriously for, perhaps not 'lengthy' amounts of time but, at least longer than I'd expect someone her age to do. I can always tell if some stranger behind me is trying to get her to smile because suddenly her eyebrows are closely knit and perched on the bridge of her nose. At a glance it looks like she's glaring multitudes of evil thoughts at some poor victim, but if she thinks they're ok, she'll instantly switch and give them the most charming smile. Or she'll release the glare, and then do her best to keep herself from smiling and that's almost as amusing as the 'eyebrow' look. Emma can say a lot of words more clearly and accurately than PC can, but her vocabulary is still far behind his. Among the words that she uses, here are a few of her favorites: Owie, Hehwoah (hello), Mom-Mee!, Mama, Pease!, NaOh!, Nana, thAydeh (thank you), DaDee, dThat, Ohwuvh (Olive), yes, hi-EE, up, dow (down), bay-bee, bah! (bad), back, cug-el (cuddle), joo (juice), deh (drink), purble (purple), moruh!, hat, bonk and MINE! There are a lot more, but I'm having trouble listing them here AND keeping the peace in the living room. Other than that, well, Emma is by far my most cuddly/snugly one. I love it when she comes up to me and just hugs my legs or if I'm sitting, she'll start sucking her thumb and put her head in my lap. When I pick her up, she almost always tucks her arms down in front of her so that they're wedged between her body and mine, and gives the most intense no-arm hug as she snuggles down as close as she can get. I'm doing a poor job describing this baby love, but it melts my heart every single time, and I love it! As far as quirks go - well, she's a thumb sucker, she is very happy to play alone, but interacts just as well with the other children, she LOVES to dance, and will start swaying, spinning or tipping from side to side within three seconds of the opening note. Another favorite activity - brushing her teeth BY HERSELF. She also does a great job playing 'lion' and has the most ferocious growl roar that she emits as she persues her prey at high speeds on her hands and feet. She loves the cats and dog, and will spend lengths of time just petting them, or snuggling with them. Her nicknames include, Yum-yum, manna, and most often - Baby. Oh, and her favorite foods are: Crayons, sour cream, crayons, cheese, grapes, pomegranates, juice of any type, cheese, crayons, salad dressing, avocados, tomatoes, cheese, olives and crayons. Did I forget the crayons? And now I must restore order to the ranks. I find it so hard to summarize children, great job!